Soon this ambitious project of 110 acres will begin. Improvements and development along Vallejo's Waterfront will cover just South of River Park to past the Vallejo's only boat ramp. What does the Vallejo Waterfront Project include? What is the name of the waterfront developer? Callahan/DeSilva Vallejo LLC is the developer responsible for overall development of the waterfront and the multi-modal transit center known as "Vallejo Station" located in downtown. A Disposition and Development Agreement (DDA) was executed between the Redevelopment Agency (Agency) and Callahan/DeSilva Vallejo, LLC on October 17, 2000 for the development of the Waterfront/Downtown Master Plan. Are they local developers or from outside Vallejo? The main offices of Callahan/DeSilva Vallejo LLC are located in Pleasanton and Dublin, with a local information office in Vallejo. A request for proposals was issued in 1996, resulting in many responses. The Vallejo City Council selected Callahan/DeSilva Vallejo LLC as the most qualified developer to develop the Waterfront and help revitalize the downtown. The major components of the Waterfront Project include a project area of 110 acres. Thirty-five (35) acres will be public uses, including a public parking garage to consolidate ferry parking and the bus transfer station. Of this, roughly 28 acres of the completed project are parks, open spaces, plazas and promenades. No more than 562,000 square feet of retail/commercial/office space is planned, along with 1,090 residential units. These numbers are just estimates, as the actual numbers will be determined during the plan and design review process. Please see the attached map for more detailed project information by area. When was the project first brought to the city’s attention? In August 1996 the City of Vallejo Redevelopment Agency directed staff to solicit proposals from developers for the development of a Master Plan and ultimately an agreement to develop the various properties on the Vallejo waterfront. Was there any public input in that process? Yes. The City Council/Redevelopment Agency (RDA) established a Waterfront Developer Review Panel in January 1997. The RDA approved Callahan/DeSilva Vallejo LLC as the Master Developer in April 1997. From June 1997 to April 1999 the Waterfront Developer Review Panel and Callahan/DeSilva Vallejo LLC conducted 28 community meetings, workshops, council workshops and other community meetings. A master plan was presented to the City Council in April 1999. Was any other agency involved in the review of the plan? Yes. The Urban Land Institute – or ULI – was asked to review the plans. The ULI initiates research that anticipates emerging land use trends and issues, proposing creative solutions based on that research. ULI’s practice program is interdisciplinary and practical, focusing on trends and the basics of many different parts of the industry, including resort and residential, retail and destination development, office and industrial development, and transportation and parking. ULI documents best practices and publishes books to impart cumulative knowledge to help the development community continuously improve its performance. ULI held community outreach interviews and presented a report to the City Council in August 1999. One of their recommendations was to retain a nationally known urban planning and landscape architectural firm to develop a master plan for the public spaces in the project. The City Manager appointed 13 citizens to the Waterfront Design Advisory Committee to work with the selected firm. Wallace Roberts Todd – WRT - was chosen and, working with the Waterfront Design Advisory Committee, spent the next eight months developing the Waterfront/Downtown Plan for Public Spaces. The plan was accepted by the City Council in August 2000. I keep reading about the downtown/waterfront development. Is the same company doing the entire project? commercial/retail purposes. However, both projects are linked in terms of proximity and potential positive impact on the City of Vallejo. Representatives of the two developers have met to discuss the projects and to work together as much as possible to help the City revitalize the downtown and waterfront. 10. I’ve heard there are going to be tall buildings on the waterfront. Is this true? There are three distinct areas of the Waterfront Project, depicted on the map at the end of this section. • The Northern Waterfront Area will have no buildings greater than three stories with 35 feet maximum height east of Harbor Way, and no building exceeding one story and 25 feet west of Harbor Way. No residential development will occur west of Harbor Way. • The Central Waterfront Area will have no new buildings west of Mare Island Way. The tallest building east of Mare Island Way will be 65 feet and five stories, at the corner of Maine Street and Mare Island Way in the Vallejo Station Project. • In the Southern Waterfront Area, Marin Street will be extended to a point approximately 200 feet east of the water’s edge and then southerly parallel to the water’s edge to the extension of Solano Avenue. The tallest building in this area will be 55 feet and four stories and will be set back from the water’s edge in excess of 300 feet. All development will be east of the Marin Street Extension, except for the Waterfront Commercial parcel at the intersection of Marin and Curtola Parkway. 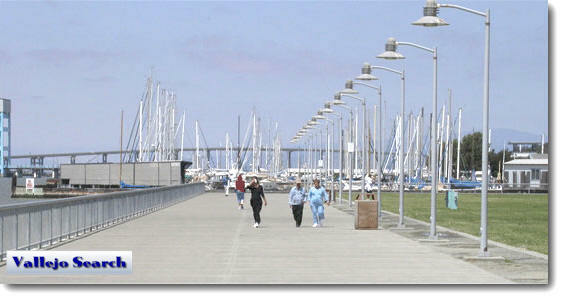 Is there any place I can go for more information on the overall Vallejo Waterfront Project? The City of Vallejo’s Public Information Officer, Mark Mazzaferro, has a file in his office with many documents related to the projects. These files are available for public review by calling 649-5462 and making an appointment. Information can also be found on the City of Vallejo web site at www.ci.vallejo.ca.us. Will this project have an impact on the local environment? A full Environmental Impact Report (EIR) is being prepared and will look at the various impacts from the project on our area. An EIR includes a review of the impacts of a project or a development on the surrounding area, including, but not limited to, air quality, traffic impacts, noise and other related impacts. Adverse impacts identified by the EIR will be mitigated to the extent feasible. What is the status of the project’s Draft Environmental Impact Report (DEIR) and the Vallejo Waterfront Master Plan? A Draft EIR was circulated for public comment and review in December 2002, and the Vallejo Planning Commission recommended approval of the Master Plan and certification of the EIR in February 2003. In response to public comments and the start of other new projects in the City, additional analysis is being undertaken. This requires that the DEIR be revised and recirculated. The revised Draft EIR is being written at this time. When will the DEIR be recirculated and how can the public participate? The DEIR is expected to be released in October 2004. Following a 60-day public review period, the Planning Commission will hold a hearing to receive public comments. A final EIR is expected to be released in January 2005, prior to the public hearing at the City Council for certification of the EIR. The public can provide comments on the DEIR at one of the two public hearings or in writing. Comments and questions on the Vallejo Waterfront Project are encouraged and welcomed at any time. What issues will the DEIR address? The Revised DEIR analyzes the cumulative impacts of the Vallejo Station and Waterfront Projects, including traffic, viewsheds, noise, water quality and air quality impacts, and related mitigations, as well as cumulative growth in Vallejo and the region to the year 2020. The DEIR also provides site plans for the Vallejo Station and Waterfront Projects, individual parcels and information on how those plans work to preserve open space along the Waterfront’s edge and fit within the downtown urban infrastructure. What approvals are required for the Revised EIR? The Planning Commission will receive comments on the Revised DEIR and the City Council will review the Final EIR. The Vallejo City Council makes the final recommendation on certification of the EIR. How will ferry service be integrated into the Vallejo Waterfront Project? The Vallejo Station multi-modal transit center, a major centerpiece of the Vallejo Waterfront Project, will make it easier to use public transit, integrating access to the ferry and local/long-range bus services, and will accommodate auto, bike and pedestrian access. Pedestrian connections will link Vallejo Station and Waterfront/Downtown areas. Underground parking will be provided in Vallejo Station for ferry and transit riders and others who shop, work and recreate in the Downtown and Waterfront areas. How important are the waterfront and downtown development projects to the future of the City of Vallejo? Along with the reuse of Mare Island, the waterfront and downtown developments are important to the future success of Vallejo. Jobs would be created, both in construction of the project and businesses located there afterwards; new retail outlets would generate sales tax revenues for the city; property developed in this project area would generate property taxes for reinvestment in public spaces and infrastructure; the city’s image and reputation would improve; and residents would be provided amenities in terms of shopping, dining and other quality of life issues. How much will the redevelopment agency be selling the land for? The DDA establishes that the purchase price for each of the Developer Parcels to be conveyed from the Agency to the Developer will be equal to an updated Base Fair Market Value (Updated Fair Market Value) established by a licensed and qualified appraiser prior to close of escrow for each Developer Parcel. None of the Developer Parcels can be conveyed to the Developer until after the EIR is certified and the necessary approvals for development are granted by the City Council. Updated appraisals will be completed during the same time period as the City Council is considering certifying the EIR. Once appraisals have been completed, the properties will be sold at fair market value established by the appraiser. How will the Redevelopment Agency use the funds and taxes generated by the private development? Funds generated by private development in the redevelopment areas will be reinvested by the City in public spaces and public infrastructure in the Waterfront Project. How long will both the waterfront and downtown development projects take? We expect the projects to take between 10 and 15 years to complete. How come the City is using two developers instead of one for the waterfront and downtown redevelopment projects? The Vallejo Waterfront Project was conceived before the City received interest in the current proposed new downtown development. As a result, the projects were presented separately. Also, using different developers working together gives more diversity to the project in terms of design ideas, concepts and project marketing. What guarantee is there that the developers will finish the Vallejo Station and Waterfront Projects? One of the reasons the City chose Callahan/DeSilva as the developer is because of its track record in completing large, complex projects. The developer is engaged in a full planning exercise for all the parcels in the project and is committed long-term to successful completion of the projects. The Vallejo Station Project has qualified for substantial funding from federal, state and regional sources that will enable it to proceed in an orderly fashion when the EIR for the project is certified. What type of businesses will be located at the waterfront and in downtown when the projects are completed? Among the businesses expected to locate in the project areas are a hotel, office buildings, restaurants, upscale retail, condominiums, and other services and businesses. I thought the Empress was the downtown’s performing arts center. Will there be two? The Empress Theatre project is for an interim performing arts center. Eventually the hope is that in the long term a new performing arts center will be built, but the Empress will still remain a key part of the overall arts and entertainment district. Who is paying for the public spaces improvements on the waterfront? Most of the costs for public space improvements will be paid from the reinvestment of funds collected through the sale of properties, development fees paid to the City on a project-by-project basis, and the property tax increment generated by the project. Why is the City pursuing waterfront development? The City Council adopted the Waterfront/Downtown Master Plan and hopes to make the area an active and enhanced environment for residents of and visitors to Vallejo. This is consistent with redevelopment plans and would result in an area with parks, public spaces, shopping, dining, residential and other amenities that the City lacks today. It will stimulate economic development, create increased employment opportunities, encourage major businesses to locate in downtown Vallejo, and provide greater opportunities to live, work, shop and recreate in Vallejo.